his must be one of the most relaxing ways to spend a few days (providing of course the storms don’t come up – then it turns into an adventure second to none). Lake Kariba houseboating holidays are legendary and most days are calm and sunny. The Zambian side of the Lake is not crowded with other houseboaters, in fact there are only a few boats that operate on this side. On the Zimbabwean side there are hundreds. The lake, however is big enough to feel completely isolated as you drift along the banks or over to the many islands. The sunsets and sunrises are spectacular. 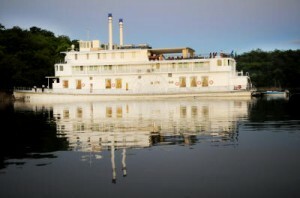 You can hire a luxury cruiser with cabins and crew to serve you in style, or take your own food, bring loads of friends and party ’till you drop.